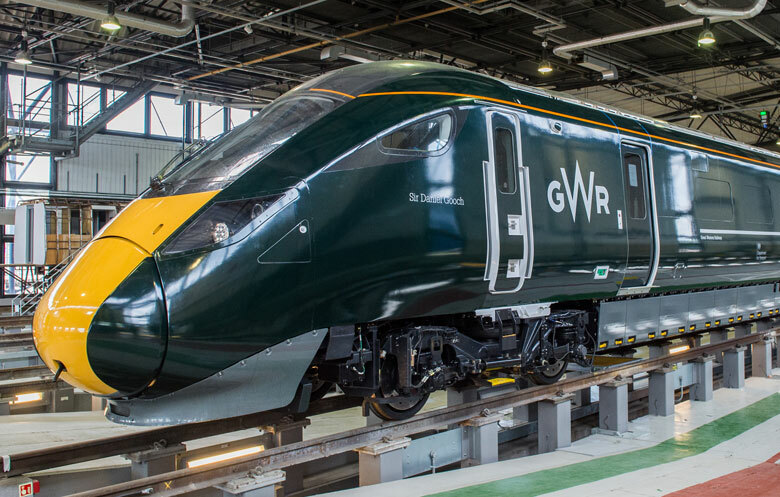 Great Western Railway (GWR) has unveiled the first of its new Intercity Express Trains, which will begin operations from next summer. The Hitachi built trains will feature “more seats, greater legroom, free wifi, power sockets at each seat, LCD seat reservation indicators and increased space in overhead luggage racks”. They will start to operate on the Great Western Main Line from next summer, followed by services between London, Devon and Cornwall from 2018. GWR unveiled the first of the new fleet of trains as part of the 175th anniversary celebrations of the first train running on the line between Bristol and London. Guests are being invited to travel on the new Class 800 (800 004) Intercity Express Train today between Reading and Paddington. In a press release GWR noted that “The Intercity Express Train is still in testing phase, and as such the interior layout of the train will change before going into full passenger service next year”. The Hitachi built trains are the same as the Azuma-branded trains being introduced onto the Virgin East Coast line from 2018.